The bolded part is probably the most dishonest argument in the entire Medicare for All debate. It implies that, under our current health insurance system, people who like their employer-based insurance can hold on to it. This then is contrasted with a Medicare for All transition where people will lose their employer-based insurance as part of being shifted over to an excellent government plan. But the truth is that people who love their employer-based insurance do not get to hold on to it in our current system. Instead, they lose that insurance constantly, all the time, over and over again. It is a complete nightmare. I have illustrated this point previously by showing just how often people switch jobs. The latest JOLTS data shows that, in 2018, 66.1 million workers separated from their job at some point. And longitudinal data from BLS shows that the average worker has 11.9 different jobs by the time they are 50. This labor turnover data leaves little doubt that people with employer-sponsored insurance are losing that insurance constantly, as are their spouses and kids. But we don’t need to indirectly surmise this fact from labor turnover data. A study from the University of Michigan tracked insurance churn directly by surveying Michiganders in 2014 about their health insurance situation and then following up with survey participants 12 months later. The amount of insurance churn they picked up was even higher than I would have imagined. The situation is even worse for other kinds of insurance. 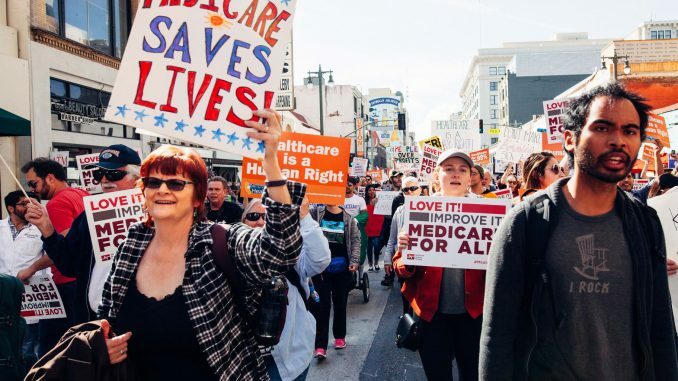 One thing opponents of Medicare for All frequently say is that poor people in the US are already covered by free insurance in the form of Medicaid and that Medicare for All therefore offers them relatively little net benefit while potentially raising their taxes some. But what this argument misses, among other things, is that people on Medicaid churn off it frequently, with many churning into uninsurance. According to the Michigan researchers, a whopping 30 percent of Michiganders on Medicaid in 2014 faced a spell of uninsurance in the 12 months after they were initially interviewed. Medicaid is a godsend for many, but it’s wildly unstable coverage, and that’s even in a state where the GOP is not doing everything it can to kick people off the Medicaid rolls. As with many things in current US politics, the divide of opinion on whether Medicare for All is a good idea is heavily generational. Young people are for it. Old people are more skeptical. This age gap is probably mostly driven by ideological differences between the generations: the current crop of young people is much more left wing than the current crop of old people. But there may also be an objective material basis for this divide. In this Michigan survey, 47 percent of adults aged 18 to 24 churned off their insurance plan during the 12-month survey span. Only 18 percent of adults 56 or older did. It is easy therefore to see why young people are not as spooked by the idea of losing their current insurance as part of the transition to a Medicare for All system: half of them already lose their insurance every single year. Although older people have it somewhat better, it is worth emphasizing that their churn is still unacceptably high with nearly 1 in 5 of them churning off their insurance every year.